Over 850 large precast units and 1,400m3 of insitu concrete. Night time construction carried out adjacent to two railway lines in tightly controlled track possession periods. Offsite manufacture ensured the fit of components into the structure on a first time basis direct from delivery vehicle. Highly detailed construction sequence planning of night and day deliveries to ensure minimal disruption in busy town centre location. The Bolton Interchange project provided the centre of the town of Bolton with a major infrastructure improvement of a brand new bus and rail interchange – making travel easier for inhabitants and visitors. PCE Ltd were approached by Kier Construction to provide an offsite build solution for the original insitu concrete designed podium deck that supports the bus station passenger concourse and bus roadway. The location of the site in the centre of the town required concise logistic planning for all deliveries. Due to the proximity of two live railway lines adjacent to site boundaries, night time possession work was required to be undertaken. 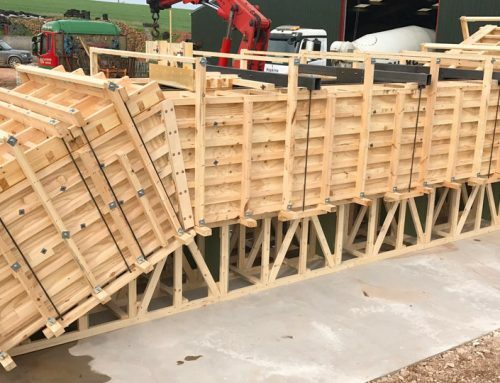 It was thus critical that the delivered precast units would be accurately designed and manufactured to fit first time to ensure there was no overrun of the possession periods. Working with Kier, Transport for Greater Manchester and their design consultants, PCE developed a fully computer modelled Hybrid structural solution that would require the offsite production and delivery of over 850 components and the placing of over 1,500m³ of insitu reinforced concrete over the precast deck units. The use of computer modelling enabled the structure to be developed ensuring there was no fit discrepancies between the precast units and that coordination with the Architect and other trades would maximise the design efficiency. The final design solution was for precast columns to support a mix of prestressed and conventionally reinforced precast concrete spine and edge beams supporting either precast prestressed solid or hollowcore flooring units. The precast parapet units, especially adjacent to the live railway lines, needed to be designed to resist potential impact loads from the bus vehicles. Precast concrete shear walls and components forming the stair/lift access to underneath the podium deck provided frame structural stability. 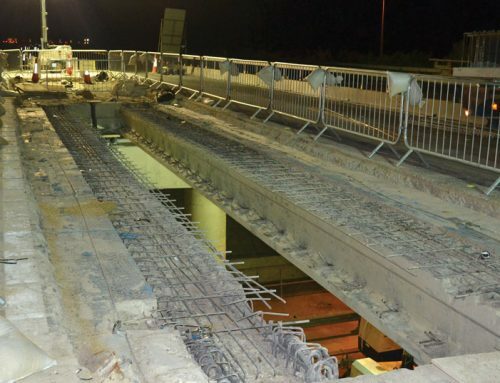 The spine beams were cast with projecting reinforcement with the reinforced insitu concrete topping being designed to act compositely with them, thus enabling lateral structural ties and load transfer. The client required PCE to incorporate a special waterproofing agent in the concrete mix for the insitu works, as opposed to the final wearing course to minimise long-term maintenance costs. This required the site team to adopt a specific regime for the insitu concrete after it was placed to ensure that it cured correctly. The design was made more complex by the requirement to minimise any propping during construction due to the site being so restricted with regards to space, external perimeter access and other trades. Columns were cast with special connections at the base to provide an alternative solution to propping. 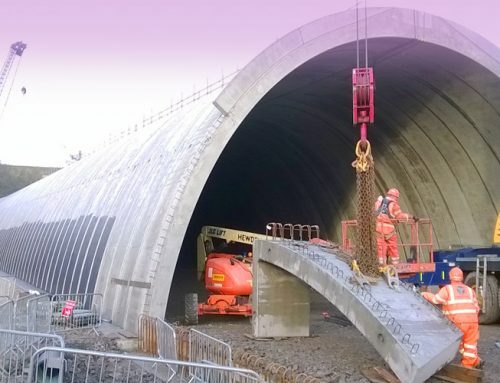 Whilst erection was carried out using a 130 tonne crawler crane, restrictions were imposed by the railway boundary conditions on its positioning and jib limitations requiring PCE to develop bespoke installation techniques for some units. The project was fully modelled and coordinated with the architect and other trades in order to make the most of potential design efficiencies. This was originally an insitu scheme, which was converted to a precast solution in order to bring considerable efficiency savings to the programme. More than 850 precast concrete units were installed including columns, edge beams, spine beams, wideslab, hollowcore, shear walls and parapets. 1400m³ of concrete topping were provided and poured during construction. As on all PCE projects maintaining the highest levels of Health and Safety is of the paramount importance not only for the company’s own staff but also those of all other companies working on the project. Regular reviews of Health and Safety procedures with Kier Construction were carried out and the PCE project team were complemented on its systems and approach. The site team also adhered closely to the PCE Quality and Planning Systems thus enabling any potential problems to be identified and resolved at the earliest possible time, with improvements to the systems being made where necessary thus benefiting future projects.